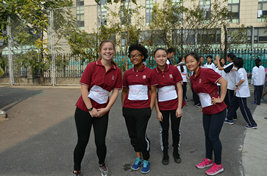 On the morning ofOctober 16, 2015, Beijing Number 80 High School held its annual sports meet onthe campus field. Teachers from the whole school and visiting dignitariesattended the ceremony. Marching intime with the swelling music, each class approached the front platform inmilitary formation. Every student walked with the spirited air of a soldier andthe vital energy of youth. Every class performed in front of the stage,expressing their patriotism and desire for harmony through different artisticmedia. 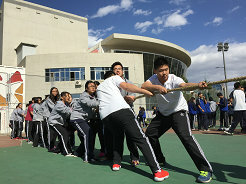 Some classes used patriotic chants to hearken back to the May FourthMovement, while others expressed their patriotism through dance or demonstratedthe ancient Chinese art of printing. One class released balloons into the air,and the audience watched as they rose, turning into small specks thatdisappeared into the autumn sky. The hearts of everyone present were on theflight of the Chinese dream. Competitions of speed and fervor. High stakes chess matches ofendurance and struggle. These were the races at the Beijing 80 sports meet. The crack of a gunshot shattered the hush of anticipation that hadfallen over the crowd. Four pairs of feet sprung into motion, and the race wasoff. The anxious spectators were caught up in the fever of thecompetition, but for the athletes, the crack of the starting pistol brought akind of release. The stresses of daily life fell away with each poundingfootfall, and the runners felt as if they were grasping at freedom with eachclenched fist they pumped back and forth. An outsider might have noticed the way the athletes soared acrossthe field as if their feet had sprouted wings. But no observer understood theexultation of the sweat-soaked racers as they drew away from the starting line,and the worries of everyday life receded behind the steady pump of bloodcoursing through their veins. Once past the starting line, the runners settled into a steadyrhythm. Although the initial rush was over, they did not forget their originalgoals, for they knew that only by challenging themselves and pushing theirpersonal boundaries could they reach true satisfaction. They raced tirelesslybeneath the embracing dome of the sky, unchecked by the elements and undeterredby obstacles. When the runners approached the finish line and sped up for theirfinal sprint, exhaustion had lain its shadow across their features. But therewas a look of peace on the face of each athlete. They had let themselves flyfree and conquered their fear. No matter which place they came in, they had learned that thespirit of running lies in moving through the excitement at the beginning andthe exhaustion at the end and emerging from one's reverie in front of acheering crowd. An athlete crouches, poised and ready to take flight. Time grindsto a halt the moment before he leaves the ground. In that moment, I saw an expression of grim determination on his face.Every ounce of control in his body was concentrated on the effort of launchinghimself off the ground and hurling himself into an unknown future. The athletes who participated in the long jump and high jumpweren't afraid of failure or intimidated by the success of other students.Because they understood that troubles only exist in order to be overcome. No matter how high or how far they had to jump,they knew it was achievable. The ball makes a perfect arc in the air. Under the scorching sun,a player flings his tired arms forward and lets out a desperate laugh as theball slips through his fingers. But at this moment, it doesn't matter how many failures he hassuffered or will suffer again. In this one inimitable moment the player is withoutregrets. That ball is like the challenges each of us face throughout life. The player picks up the ball, launching it into the air in anothergraceful parabola, and again begins the chase. These encouraging words provided a lot of support to the players,and bore the weight of the spectator's hopes. Although they were on the sidelines, the spectators were anythingbut idle. They helped the players paste on their number cards, they cheered thename of each tired runner who passed by, and they stood by to offer theexhausted athletes a glass of water, a piece of chocolate, and a consoling orcongratulatory hug. Although they didn't compete, their support allowed the athletesto keep going. These are the people who make final judgements on each match. They work tirelessly to ensure fairness and impartiality in theirfinal decisions Sometimes they might be misunderstood by the students, but theystill continue to enforce the rules of the contests. Their responsibility spursthem on – although it may be hard to remain level headed, they must continue toact out their crucial role. Their caring attention is always present. Before the matches, theyremind the players to prepare well for their activities and patiently explainthe rules. After the races, they support the students who fell down. While their support is easy to overlook, the sports meet would nothave been possible without them. In this sports meet, every teacher and student tried theirhardest. Before the matches, they went through tough training and gotthemselves into a competition mindset. Every player embodied the Olympic mottoof “faster, higher, stronger,” and, more importantly, kept the adage of“friendship first, competition second” in their hearts. Every athlete struggledon the field, every spectator looked on in a civilized and encouraging fashion,and every judge held the players to a high moral standard. Only with theextraordinary efforts of everyone involved was the sports meet able to come tosuch a successful conclusion.